If you sell ebooks online, here's how to greatly reduce the number of ebook refund requests you get. The few ebook returns you have, the more money you make selling ebooks online. As the author of over 30 ebooks to date, I use this system to keep my ebook returns less than 1%. You can too! Every time I get an ebook return, I wonder what I could have done better to prevent it. I think, “I was clear about the info included, why are they requesting a refund?” This feeling quickly subsides though because it doesn’t happen that often. Before we go any further I want to say, this ebook is not for every ebook writer, publisher and/or seller. While much of the information within will apply to many ebook writers, publishers and sellers, the material here is specifically for those who deal in the how-to, non-fiction genre. With that being said, let’s start the discussion. Publisher Note: Get the special deal offered with this ebook. I’m lucky, less than 1% of those who purchase ebooks from InkwellEditorial.com (my company) request a refund. I’ve been selling ebooks online since 2004 and went back through almost three years of records (and yes, my eyes are bleary from looking at all those numbers). I ran my return numbers from PayPal from January 1, 2009 through August 29, 2011 – just from my website, InkwellEditorial.com (not Amazon or Clickbank or Lulu – other places I sell ebooks). I chose this time period because (i) it was the most recent as of this writing; and (ii) before then I wasn’t logging almost daily sales like I do now. Following is what I found . . . I processed exactly 20 refunds out of over 2,500 transactions. Roughly that anything less than this percent seems to be about the norm. But again – this can’t be stressed enough – your ebook return rate depends a lot on some key factors. 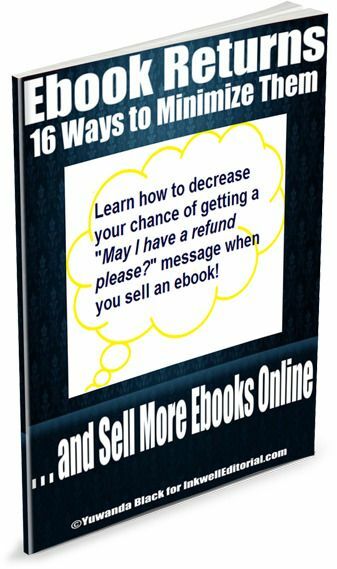 With this researched info in mind, following are 16 things you can do to minimize ebook returns.